Elf is a 3 lbs. Chihuahua who left Penn Vet this week with a clean bill of health and chance to see the next 15 New Years. 1 Love pulled Elf from the "Urgent" list of a Big City animal control facility. A life-threatening infection caused Elf to rapidly lose weight. Dehydrated, malnourished, incoherent, muscle spasms, Elf made an odds-defying recovery thanks to the doctors, nurses, and staff of Matthew J. Ryan. It was a Christmas Miracle. Now we need another miracle: Help covering his medical expenses. Penn provides us generous discounts but Elf's progress was charted in daily charges/expenses and 1 Love needs to raise the funds to pay the balance. 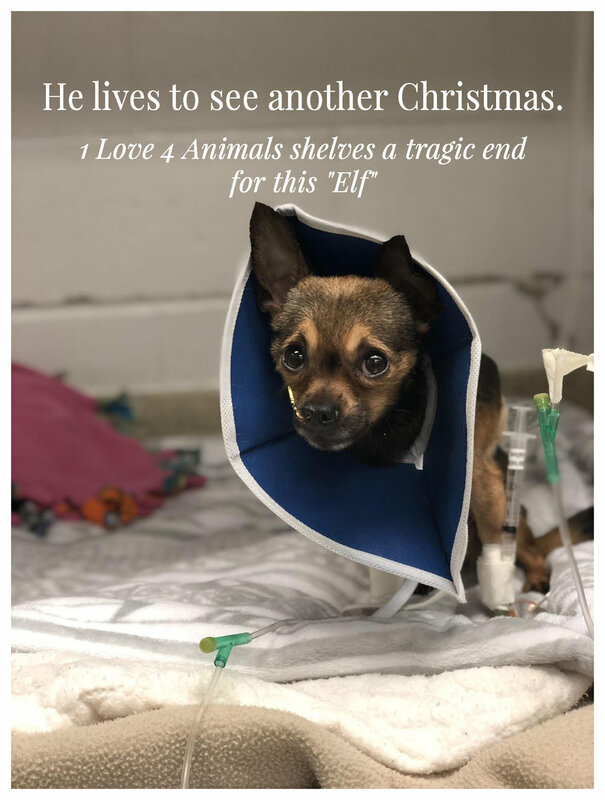 Please make a donation to 1 Love 4 Animals this Christmas and help an Elf. 1 Love 4 Animals met with Lily Tomlin, acting icon and animal activist, in Boston last night. Lily holds 1 Love’s newest tee, “Puppy Mills: Yet another way men exploit the female body.” Most puppy millers are men profiting from deliberately and systematically impregnating hundreds of female dogs. Julie was rescued from a puppy mill in Lancaster County, PA by 1 Love’s volunteers. 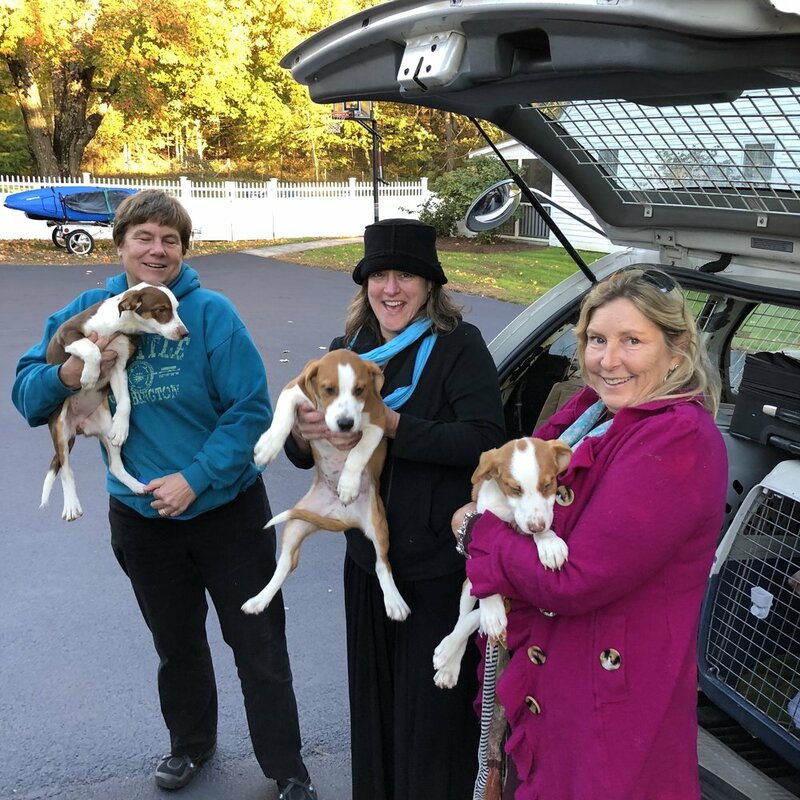 Working with Angels Helping Animals in Martha’s Vineyard, Julie found a great home and now has four Rottie brothers and sisters. She swims in the ocean every day and just won a blue ribbon at a dog show!! We are so proud of our sweet Julia. There are millions of dogs just like Julia who just need a chance. Adopt a shelter dog (or cat) today. We need help covering Will & Grace's medical care! Will was pulled from a high-kill shelter by our rescue, 1 Love 4 Animals. Our volunteers rescued Grace from a puppy mill in Lancaster County, Pennsylvania. "She's throwing dead puppies!" said Farmer Stoltzfus, the day our volunteer picked up Grace the Bulldog. Three days later and hours before her spay appointment, this sweet dog gave birth to another stillborn puppy. Fearing Pyometra, Mastitis and other complications, 1 Love rushed Grace to Penn Vet where she underwent an ultrasound, antibiotics to lower her fever and fight infection, and surgery the following day. Two weeks later she was back in the operating room with a twisted intestine and a bellyful of fluid. As Grace recovers from her surgeries, far from the puppy mill and the bad men who exploited her tired, worn-out body for profit, 1 Love is trying to raise the money to cover the cost of her medical care. Will was on the "Urgent List" at a Big-City Animal Control Facility. He was passed-over by adopters and other rescues because he appeared to be blind. A thick green crust covered his eyes making it impossible for him to close his eyes or blink. So impressed by this little dog's bravery and sweetness, considering how much pain/discomfort he was experiencing, we agreed to take him into our rescue. Soon our vets were examining Will's damaged eyes and providing the necessary medications. Will has a long road ahead (costly treatments and pain management) but we're hoping to bring his sight back. We want him to see how much his new family loves him (once he finds a home). Amount we hope to raise on GoFundMe for both Will & Grace's medical care: $12,500.